When I was expecting my second baby, who would be born only 20 months after the first baby, I gave some consideration to what I could do to make things easier for us. One thing that stuck out sharply in my memory from the newborn days was the trouble it was to go anywhere, specifically packing and keeping a diaper bag stocked. It involved a seemingly endless mental checklist to make sure I had what we needed. I knew that if I had to do that for a second baby, we would never get out the door. You know what it's like. You're already a few minutes late. You're trying to remember and grab everything that you need (or could possibly need) while your kids are trying to put their shoes on (or are insisting on taking them OFF), making snack requests, needing to go potty one last time, undoing their hairstyle, spilling their milk, trying to unlock the door, declaring that they must bring their baby doll with them, and watching you pull your hair out. 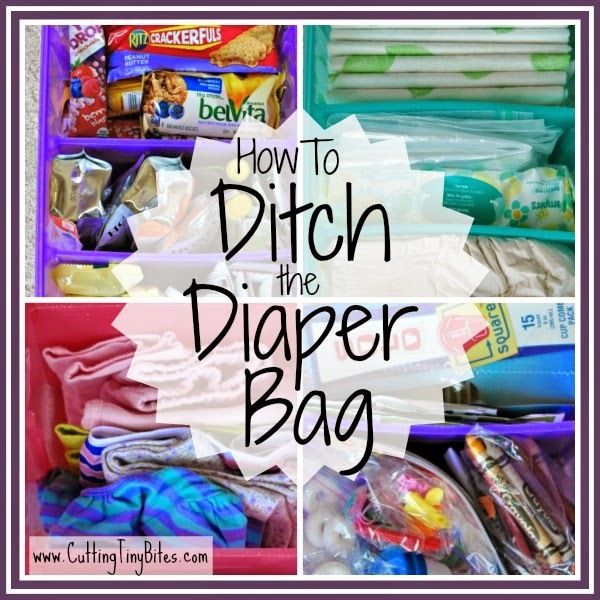 The solution is to Ditch The Diaper Bag and just keep it all in your car. 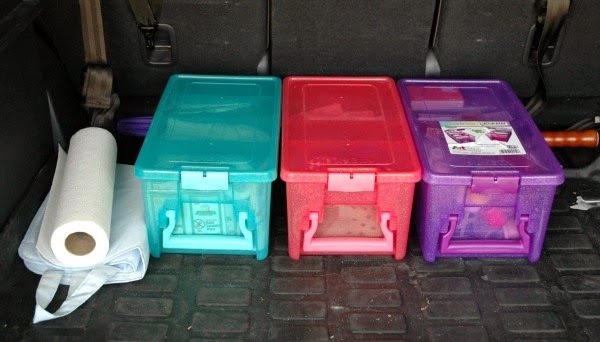 I stocked and implemented car boxes that have everything I need while out with my girls. They are lined up neatly in my trunk and I've almost never been caught without something I need. They've saved my tail too many times to count! The boxes I chose are ArtBin Super Semi-Satchels. They have an attached lid and a handle that makes it easy for me to tote them inside to restock when necessary. They also have customizable dividers, so you can make your compartments different sizes to accommodate your needs. I bought my boxes at JoAnn, using 50% off coupons, but they're also available here, on Amazon. They were not exactly cheap, but for me they were worth the investment. You could certainly recreate a similar system with something more inexpensive. 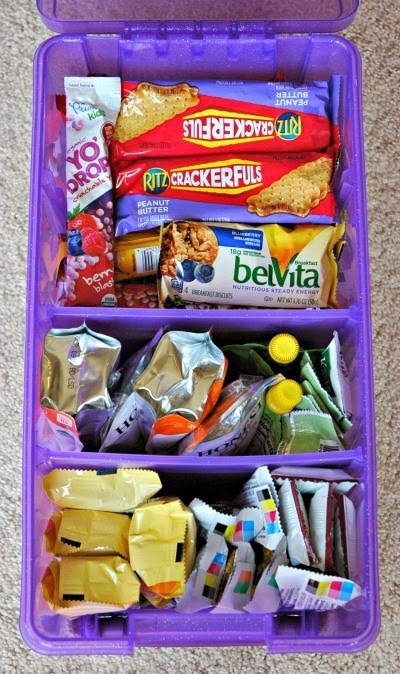 Apple sauce, granola bars, juice boxes, individually packaged crackers and cookies, squeeze pouches, or whatever your kids' favorite snacks are. I never have to pack snacks when we go out because I know that there's a big assortment in the snack box. This box stays up in the main body of the car, on the floorboards under my daughter's feet, so I can easily reach it from the driver's seat. We've been able to have impromptu picnics and stay out for longer than initially planned since I can always grab something to keep the kids (and myself) going. Every few months I bring the snack box inside and check expiration dates and restock. Diapers, wipes, disposable changing pads, gallon sized Ziploc bags, first aid kit, hand sanitizer wipes, sunscreen. My girls are both potty trained now, but I still keep this box stocked. We have plenty of occasion for wipes, and the Ziploc bags have held throw-up messes and wet clothes. During one particularly yucky incident, I used a disposable changing pad to cover my daughter's carseat after it got yucky until we got home. As we moved through diaper sizes, I have kept a couple of each size in the box, and have been able to help several mamas-in-need who have found themselves stuck without supplies. The first aid kit is for little boo-boos. The sunscreen is our back-up, because it doesn't work quite as well once its been stored in the hot car, but it would be better than nothing if we were caught unprepared. 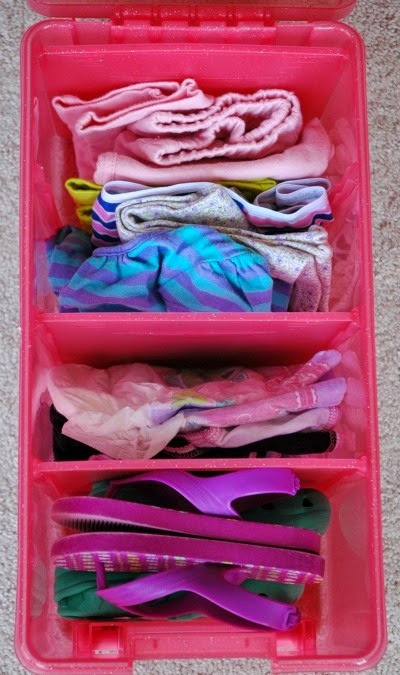 One full change of clothes for each child, including leggings, a t-shirt, underwear (several pairs and a Pull-Up for the most recently potty trained), and cheap flip-flops. Never know when you'll need these! 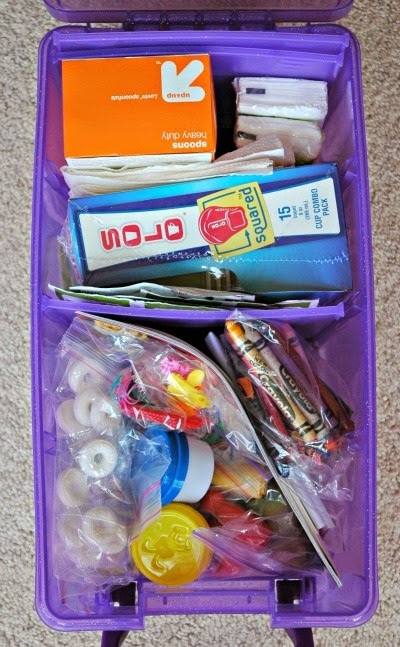 Plastic utensils, tissues, paper cups (with lids and straws), wet wipes, hand sanitizer wipes, mints, hair ties. Small tubs of play-doh, pads of paper, crayons, stickers. This box doesn't get much use, but I'm glad to have it. When we go to a restaurant, I like to have a couple of things to keep the girls occupied while we wait. I used to pack a little bag of toys, but now I just grab a couple of things from this box. We also have any thing we might need for a quick picnic. 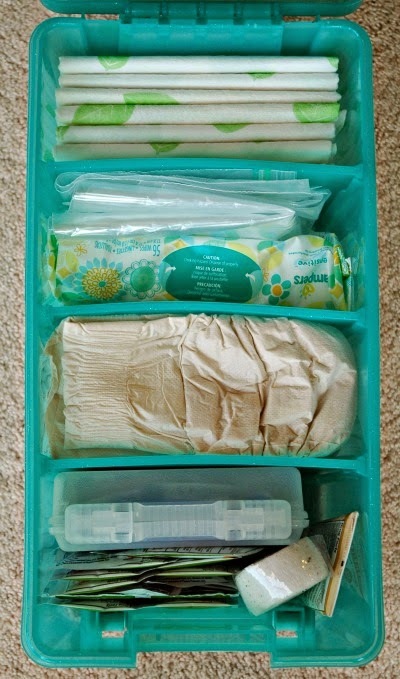 The boxes (except for the snack box) stay lined up in the trunk, along with a changing pad and a roll of paper towels. These boxes are sturdy enough that you can throw your groceries or stroller right on top without any problems. I realize that this solution doesn't work for everyone. Maybe you don't have a car, or maybe you still have an itty-bitty newborn who does go through lots of burp cloths and onesies. For most of you, though, some variation of this system will work, and will make your life oh-so-much-easier! Now you can just grab your kids and head out the door!